The Japanese word zen means “meditative absorption.” It is derived from the Sanskrit word dhyana, which became ch’an as this form of Buddhism developed in China, and then son as it entered Korea. Traditionally, the emphasis of Zen Buddhism has been on intense meditation practice, with little emphasis placed on Sutra reading (the sermons of the Buddha) or doctrinal studies. Practically speaking, Korean Zen, of which Muddy Water Zen is a representative (Korean Buddhist Taego Order), includes all of the above as important for one’s personal development and practice. 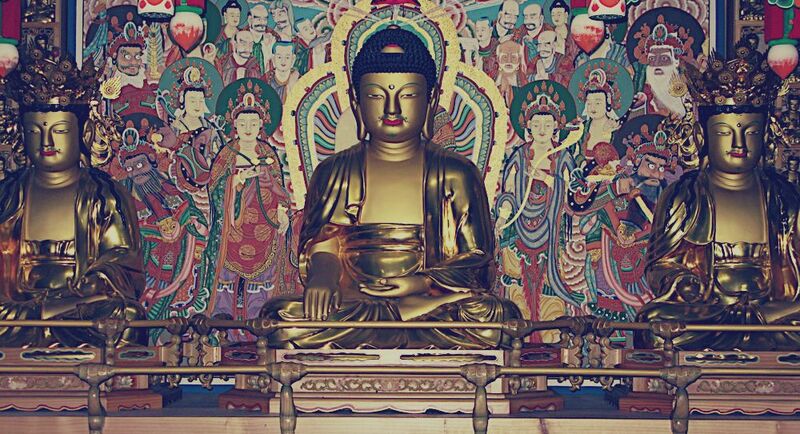 Buddhism is one of the world’s major religions, generally ranked fourth behind Christianity, Islam and Hinduism. Since it is non-theistic, i.e., God is not part of its framework, people often mistakenly assume it to be something other than a religious enterprise. Someone once said that “Religion begins with the first cry for help.” The basis of Buddhism is that life is unsatisfactory no matter how good we seem to have it. This discontentedness, this unease is commonly called “suffering.” When we recognize and admit this existential anxiety and search for relief we are led into the Eightfold Path advocated by the Buddha as the prescription for our disease. Buddha, an epithet given to Siddhartha Gautama, was a man who lived in northern India about 2500 years ago. His transformational experience, termed “Awakening,” led to him being called the Buddha or “awakened one.” Buddha was not a god but a human being who had an awakening experience. Why bow to Buddha and each other? To bow to another person is to lessen ego and its grip on our habit energies. It is also to recognize the inherent value and worth in each and every human being as well as all sentient beings. To bow to the Buddha statue is to acknowledge the debt of gratitude owed to the historical Buddha and his teaching (Dharma); additionally, it is to acknowledge our own capacity for awakening.